Who says au gratin has to be the same ol’ thing your mama used to make? 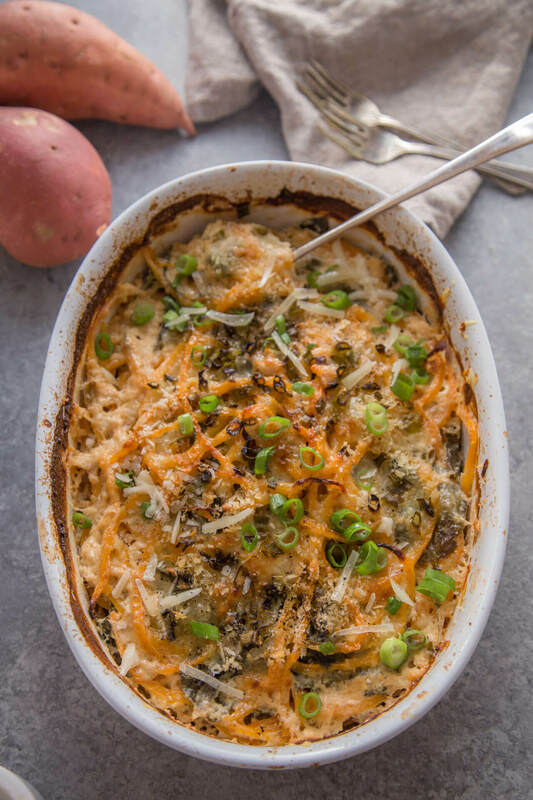 This sweet potato kale au gratin gives a healthy twist to a beloved favorite! Preheat an oven to 375°F. Rub the inside of an 8″×8″ baking dish with 1 tbsp. of the butter. In a saucepan over medium heat, warm the remaining 3 Tbsp. butter. Add the shallots and cook, stirring occasionally, for 3 minutes. Add the half and half and cinnamon, season with salt and pepper and grate in the nutmeg. Remove from the heat and let cool slightly. In a large bowl, toss together the sweet potato and kale. Pour the cream mixture over the potato mixture and toss to coat. In a small bowl, stir together the Gruyere and Parmesan cheese. Arrange a layer of the sweet potato and kale mixture in the prepared dish. Sprinkle with one-third of the cheese mixture. Repeat the layering twice more, ending with the cheese. Pour any remaining cream from the bowl over the gratin and top with the scallions and panko. Cover the dish loosely with aluminum foil and bake for 45 minutes. Remove the foil and continue baking until the top is golden and the vegetables are tender when pierced, 30 to 45 minutes more. Let stand for 10 minutes before serving. Serves 8 to 10.